The Greater Reston Arts Center (GRACE) welcomes a new exhibition to the gallery at Reston Town Center Friday. 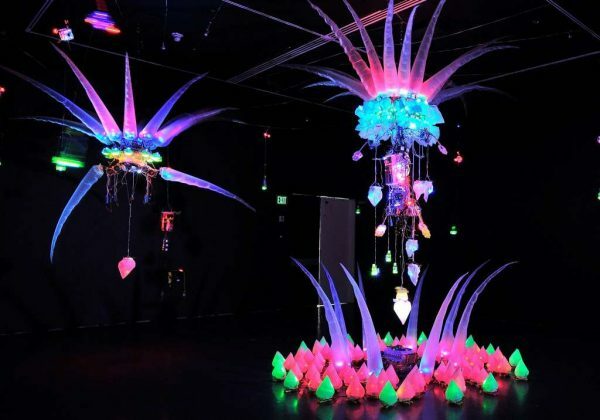 Synthetic Transformations is an installation by Taiwanese multimedia artist and TED Talk fellow Shih Chieh Huang. The installation features interactive elements created from a variety of materials including LED lights, motion sensors, computer parts, screens, and mundane objects such as plastic bags and Tupperware. Says GRACE: “With these humble components, the artist creates magical, immersive environments, featuring sculptures that respond to the viewer’s presence with movement, sound, and illumination. GRACE will hold and opening reception Friday from 6 to 9 p.m. The exhibit will be at GRACE until Nov. 19.